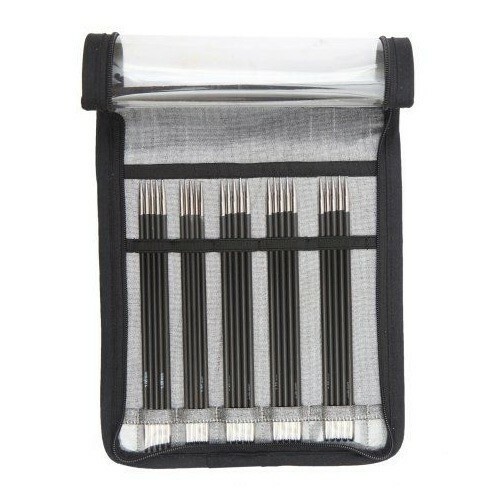 Karbonz DPN Set 15 cm/ 6"
KnitPro Karbonz DNP set 15 cm/ 8" in 5 sizes from 2-4mm (US 0-6). KnitPro Karbonz double pointed needles set - 15 cm / 8" comes in 5 sizes of the most popular sizes from 2 (US 0) -4 mm (US 6). In the stylish and revolutionary Karbonz series, the needles are made of lightweight and elegant carbon fiber, making this particular knitting experience something you don't wanna miss out on. The reinforced tips in the brass let the pins slide easily and elegantly through the stitches and provide a unique knitting experience. Smooth and beautiful to knit with. My favorite needles. A perfect set for a beginner.